Well, it’s been a couple weeks since I updated, mainly due to a nasty bout with a kidney infection. Luckily for all of you, my experience made me realize that I should talk about how to replenish your healthy gut flora after it’s been decimated by antibiotics! A kidney infection isn’t something to mess with, and refusing to take antibiotics quickly can cause permanent kidney damage. And hey, I like my kidneys. They do lots of important things for me, like control my blood pressure, make red blood cells and keep my bones strong, and remove waste and fluid that I don’t need. So yeah, I’d like to keep them. 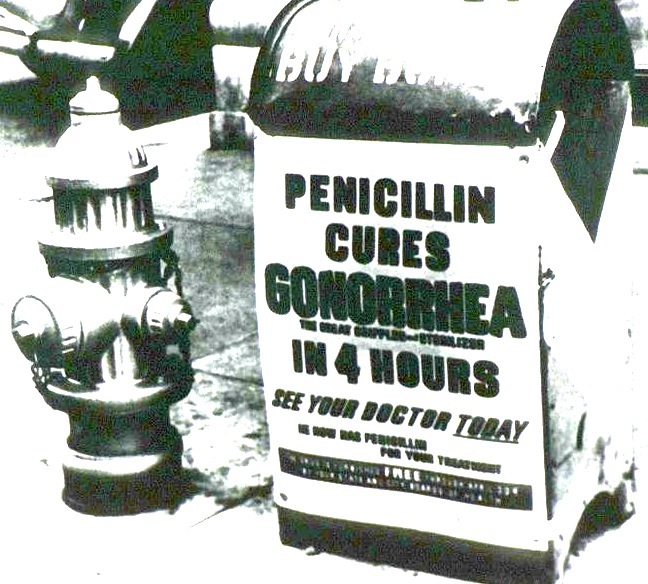 But after two weeks of antibiotics, I was feeling the effects. For whatever reason — regular physical activity, daily coffee, a vegan diet high in fiber — I am fairly, ahem, regular. But all that went right down the proverbial toilet. Antibiotics are just what they sound like: prescribed killers of the biological agents known as bacteria. And while I had to get rid of the bad bacteria in my kidneys, taking them meant that I killed the good gut flora in my digestive tract, too. But how and why gut flora is important still largely remains a mystery to researchers. Some scientists have speculated that being born without a healthy gut flora store, or not maintaining a balanced microbiome throughout life, might cause autism spectrum disorders, obesity, allergies and asthma, and even Parkinson’s disease. The research is so important that Michael Pollan himself wrote an op-ed detailing the his voluntary biomapping of his own gut flora, a piece that went viral via the NY Times this year. Few of the scientists I interviewed had much doubt that the Western diet was altering our gut microbiome in troubling ways. Some…are concerned about the antimicrobials we’re ingesting with our meals; others with the sterility of processed food. Most agreed that the lack of fiber in the Western diet was deleterious to the microbiome, and still others voiced concerns about the additives in processed foods, few of which have ever been studied for their specific effects on the microbiota. Some hospitals have started to jump on board the beneficial bacteria bandwagon. During my internship at OHSU, I learned that dietitians at OHSU and several other hospitals in the area will automatically order kefir or Nancy’s Yogurt for a patient who is taking antibiotics, as a way to replenish their healthy bacteria. As a dietitian, that’s pretty fascinating to me! But what about replenishing gut flora by way of vegan foods? Don’t worry, kefir isn’t the only solution for a bare digestive tract. In fact, there are lots of ways to help your gut grow back some of its little helpers. 1. Eat fiber. Any kind. All kinds. Soluble fiber (fresh fruits and veggies, legumes, seeds, oatmeal, psyllium, flax, etc.) will be fermented by bacteria in the colon and synthesized into vitamin K and some B vitamins, and short chain fatty acids. The SCFA will nourish the walls of the colon and may prevent colon cancer, ulcerative colitis, and diverticular disease. Fiber can also decrease triglycerides and cholesterol. Soluble fiber is what’s known as a prebiotic — the stuff that nourishes the probiotics, or the healthy bacteria. Some prebiotic foods include onions, garlic, tomatoes, asparagus, whole wheat, and bananas. 2. Enjoy fermented foods. Tempeh, sauerkraut, pickles, kimchi, miso soup, and kombucha and Kevita are fantastic alternatives to dairy probiotics. Even wine and beer have some probiotics in them (but I would recommend a hearty tempeh stir-fry in addition!). Try namu shoyu, a Japanese soy sauce, drizzled over tempeh and broccoli. Watch out for fermented foods with vinegar: oftentimes, the vinegar ends up killing the good bacteria. Lacto-fermented products are a better choice. 3. If you’re really worried, try a supplement. GoodBelly, Garden of Life, and RawGreen Organics are just a few of the vegan options I found. However, these supplements tend to be pricey, as most supplements are. A balanced diet with the aforementioned foods should do the trick. Be aware: the strain of bacteria known as lactobacillus is vegan in and of itself, but is often grown using a dairy food source. Knowing this, I would choose a supplement that does not list lactobacillus in its probiotic arsenal. Here in Portland, lots of people try their hand at fermenting their own kombucha and pickling vegetables. It’s really not that hard, and making your own food is quite empowering! There are lots of references out there for trying your hand at fermenting foods and beverages safely and effectively. Try this guide! If you already enjoy a balanced microbiome but are considering having a baby, listen up: as it pertains to healthy gut flora, researchers have found that breastfeeding will promote a more diverse bacterial landscape compared to formula-fed babies. These bacteria work to protect your baby against toxins and other intruders that might cause illness such as colic. These bacteria can influence your baby’s immune system for life, and might mean the difference between allergies, asthma, and other auto-immune conditions. 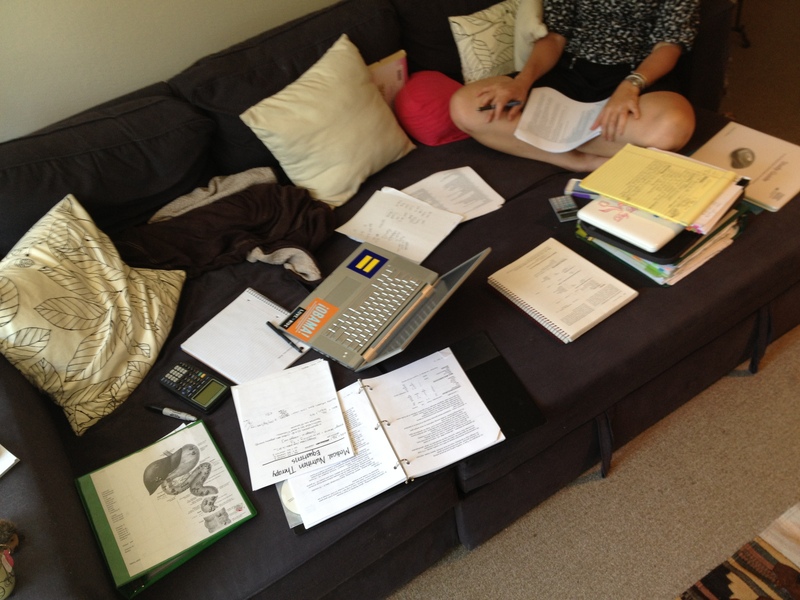 This past week I decided I wanted to take my board exam a little earlier than my original goal of August 2. In fact…I wanted to take it three weeks earlier. Controlled chaos. I especially like my nutrients in the gut absorption sheet on the left. I live by making cheat sheets for everything. 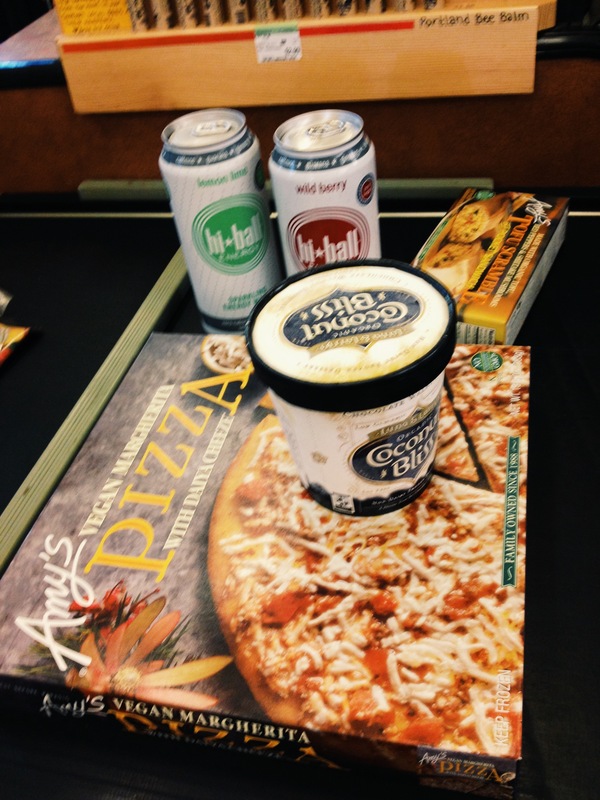 Vegan pizza, ice cream, and high ball….that’s just normal study fuel, right? I PASSED!! 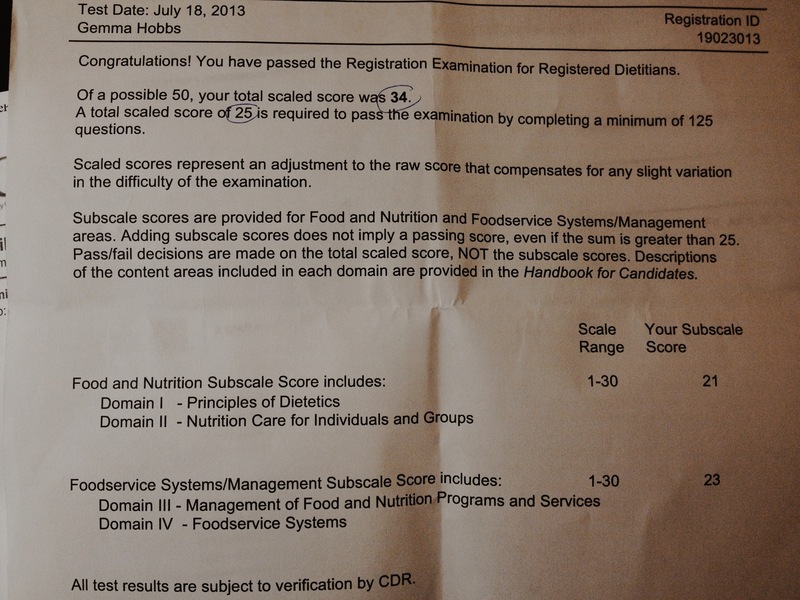 I am officially a board-certified Registered Dietitian! I can’t help but look back to my senior year in high school (2007) when I decided I wanted to be an RD. If I had known that this road would have left me in tears of frustration over failing my first college chemistry course, or with a total dependence on caffeine in any and all forms to get through studying for exams, or would have tested my ability to push my own boundaries in every internship rotation I had…I might have reconsidered my decision. But one of my mottos in life, and one of my tricks to living joyfully, is to take things one baby step at a time. So bit by bit and piece by piece, I chipped away at this degree and this registration. Walking out of that exam room, knowing that I was officially an RD, was the sweetest reward after years of specialized study. Yeah, I’m gonna enjoy this feeling for a long time. One of the immediate perks about being a baby RD is that I get to write my very own post about how to study for the exam! This is always a hot topic item for pre-RDs, so I hope my point of view is helpful. My friends, it was rough, and weird test. Why? The RD exam questions your ability to think critically, creatively, and to reason with yourself. Oftentimes your first instinct will be right, but only if you’ve trained your brain to search for the most right answer, and for the answer that would make sense in the time frame of the question. I was a little miffed at Inman‘s, if we’re being honest. I learned a lot of solid, useful nutrition information when studying it, but I felt that <20% of it applied to the exam. There were multiple questions that had terms that I had never heard of, or managerial situations that I’d never experienced, in which I simply had to take my best guess. In fact, I was unsure about my answers for at least 70% of the test. I also took a CDR practice test, which was similar to Inman’s but only provided rationales for about 10 questions out of 125. Not very helpful unless you’re already feeling comfortable with the subject matter and just need some reinforcement. The RD in a Flash was useful and covered a wide range of topics. I actually wouldn’t have known the answers to several questions on the exam without those flash cards. 1. Review basic nutritional parameters. The test will ask mostly quite general questions about nutrition care, and you need to be familiar with what an RD would do when caring for a patient with any number of conditions. I remember a lot of content on malnutrition, HIV/AIDS, pregnancy, diabetes, and sports nutrition. 2. You will have plenty of time. I had a 2.5 hour limit and finished the whole thing in just under 1.5 hours, and I’m a slow and steady test taker. So take your time! If you feel like you’re losing control of the situation, just take a few minutes to gather your head. I found it helpful to write out my reasoning on the scrap paper provided. 3. Be prepared for surprise questions, and don’t be scared of them. There are some questions that you will have absolutely no clue what any part of it means. Again, sit back, approach it from a different angle, and try to deduce the answer. Most of the managerial and food service portions are just basic common sense, and even if you don’t remember an equation you can probably figure out the answer using basic math. Trust in your fundamental education–we went to high school for a reason! Also, some of the questions on this test are dummy questions that are being tested out, and aren’t going to count for your final score. It’s possible that the surprise questions fall into that category. 4. Don’t skimp on studying community nutrition principles, especially related to governmental assistance programs and the scope of practice for different programs like WIC, Elderly Nutrition, SNAP, etc. It’s helpful to know who runs which programs, and whom they serve (example: the home-bound elderly, prison inmates, school children, etc.). 5. Trust your education and your internship. Bottom line? It’s in the Academy’s best interest to churn out more and more dietitians each year. The test will be challenging, but not too challenging that you won’t be able to pass it if you have paid attention in college and done well in your internship. After taking the test, I actually think that everyone coming out of an internship could take it right off the bat. Don’t spend weeks and weeks studying for this. You will do better just to review the basic principles of each domain of dietetics, and then trust in your gut intuition and basic reasoning skills to get you through the rest. I’m so glad I didn’t waste time studying more than I needed to! I’m confident that if you’ve had a solid internship experience, like I did at Oregon Health and Science University, you’ll be fine. 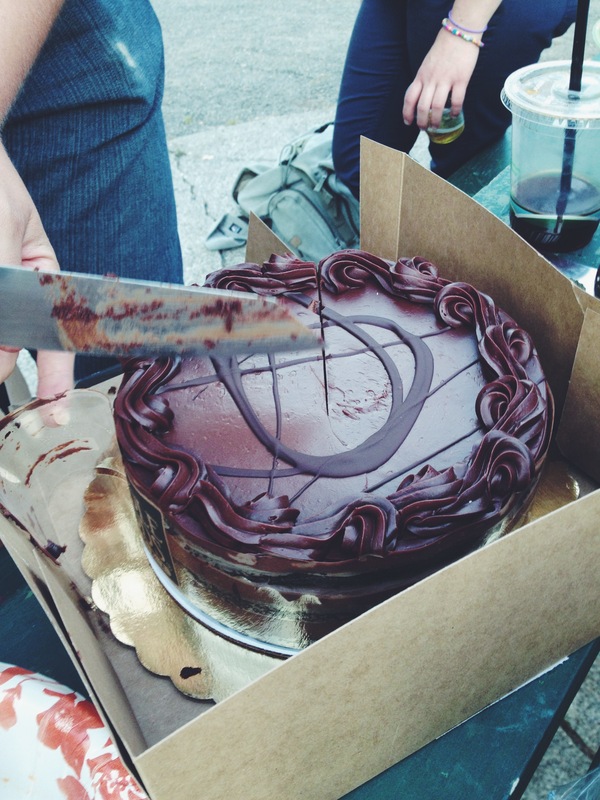 You’ll end up with a shiny new RD credential, and maybe even a delectable vegan chocolate cake. Please comment if you have anything to add, or any questions about the test. 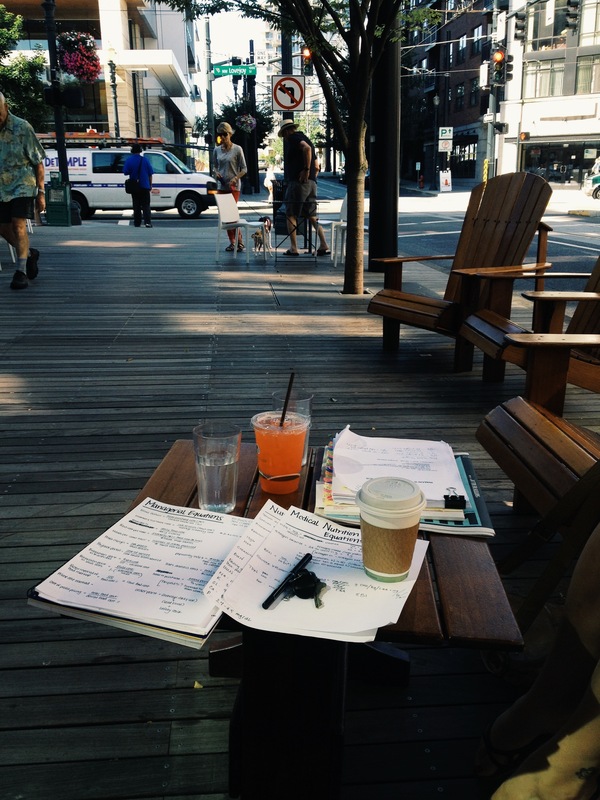 Cheers and good luck studying!